In addition to reading and reviewing this exotic and intoxicating novel about Empress Theodora, the author Stephanie Thornton wrote an engrossing guest post about the Plague! First, before I confuse anyone, Justinian’s Plague and the Black Death were actually the same disease: bubonic plague. I’ve loved plague (reading about it, not having it) since I was in high school, grossing my friends out with accounts of rupturing buboes and thoroughly enjoying the Monty Python rendition of plague. (“I’m not dead yet!”) When I first started researching Theodora’s story, I came across a reference to a plague that had hit the Byzantine Empire during Emperor Justinian’s reign, even afflicting the emperor himself. Constantinople ran out of room to bury all the plague victims and ended up walling them up inside the towers of the city walls. By all accounts, the city’s reeked of decaying corpses for a long, long time. Emperor Justinian took to the streets to rally the people when the plague first hit… and then came down with plague himself. (This allowed Theodora to take control of the government and possibly stop a coup. Because, you know, she’s kind of awesome.) You don’t hear of Henry VIII or Queen Elizabeth coming down with bubonic plague, in part because the monarchs and nobility fled to the countryside whenever an outbreak occurred. But not Justinian or Theodora! We’ve all heard the figures that the Black Death killed between 1/3-1/2 of Europe’s population. However, the Black Death was one of the final nails in feudalism’s coffin, making way for Europe to heave itself out of the Dark Ages. In contrast, Justinian’s plague killed half of Byzantium’s population (Procopius records that 10,000 people in Constantinople died each day), thereby decimating the emperor’s tax base. The Byzantine Golden Age that Justinian had begun died before it ever really got started. So while Justinian’s Plague isn’t quite as famous as the Black Death, it really was a nasty epidemic that brought the Byzantine Empire to its knees. Finally, your fun fact for the day: Bubonic plague is still endemic in the Four Corners region of the United States (complements of infected prairie dogs) and throughout Mongolia (complements of really cute marmots that happen to carry infected fleas). Thank goodness for modern antibiotics! 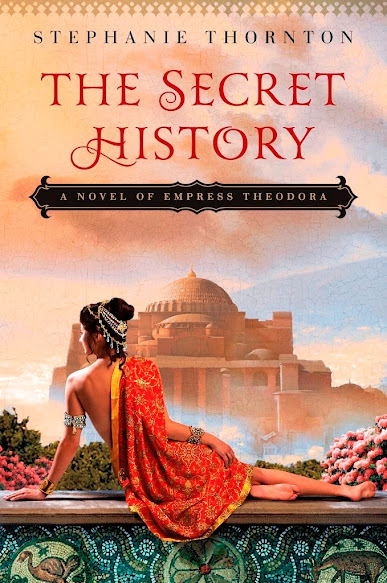 “The Secret History: A Novel of Empress Theodora” will be published by NAL/Penguin on July 2, 2013, and “Daughter of the Gods” will hit the shelves May 2014. Be sure to checkout her website for more info about her books and other upcoming events! WHAT?! Prairie dogs?! They are everywhere here in Colorado – maybe I’ll stop trying to hug one. (Okay, I don’t try to hug them, but my dogs do try to play with them). I’m going to toggle back to the review now because I have an equally morbid interest in the Bubonic plague.